Congress president Rahul Gandhi on Thursday directed senior office-bearers of the party to finalise candidates for the Lok Sabha polls by February-end and asked newly appointed Uttar Pradesh in-charges Priyanka Gandhi Vadra and Jyotiraditya Scindia to strengthen the party in the state in "mission-mode". At a meeting with AICC general secretaries and in-charges of various states at the party headquarters, Gandhi said that new faces should be given precedence over those who have lost the elections 2-3 times while selecting candidates. 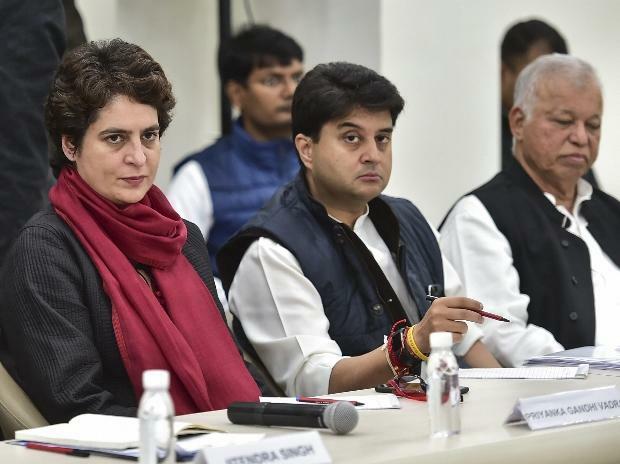 Priyanka Gandhi, who was attending the first meeting as AICC general secretary in-charge of the party's affairs in Uttar Pradesh East after taking charge on Wednesday, said she would not rest till the flag of Congress' ideology flies high in the state. "I met with our AICC General Secretaries & State In Charges at the AICC HQ this evening. Our discussions covered a wide range of subjects. The team is match ready and we will play on the front foot...," Gandhi said on Twitter after the meeting. According to Congress general secretary (organisation) KC Venugopal, Gandhi asked leaders to ensure that the campaign should be a decent one, and "not like the BJP". When asked about Gandhi's direction coming on a day he called the prime minister a "darpok" (coward), Congress chief spokesperson Randeep Surjewala, at a press conference, said that a liar has to be called a liar and it can't be helped. During the meeting with the general secretaries and state in-charges, Gandhi gave an ultimatum that selection of candidates should be completed this month itself, Venugopal said at the press conference. The need for a mechanism at the central level to monitor the campaign in various states was also discussed at the meeting , he said. Campaign strategies and alliances were also discussed at the nearly three-hour meeting. All general secretary in charges shared their views and the Congress president told them what he expects from them, Scindia told reporters after coming out of the meeting. The Congress president also gave a clear vision about the current political situation in the country -- the way the BJP government is misusing agencies and propagating false promises, Venugopal said. Surjewala said that Gandhi stressed at the meeting that in selecting candidates youth and experience both should find place. Congress chief congratulated Priyanka Gandhi and Scindia and encouraged them to work for the strengthening the Congress party in the state in mission-mode. He also highlighted that the Congress was going into polls with new ideas and in that context talked about the minimum income guarantee scheme, Surjewala said. Gandhi said the Congress has to fight divisive politics and polarisation. The citizenship bill was also discussed during the meeting and it was highlighted that the traditions and culture of the Northeast was being attacked, Surjewala said, dubbing the bill as a conspiracy. The Congress president said that if the BJP tries to bring the citizenship bill, the Congress will oppose it both inside and outside Parliament, according to Surjewala. The Congress will not allow it to be passed in the Rajya Sabha and will talk to other parties so as to defeat the bill on the floor of the House, he said. Priyanka Gandhi, in her remarks, at the meeting said she will work together with other Congress leaders to end the politics of division and casteism in UP. Rahul Gandhi has also called a meeting of state chiefs and Congress Legislature Party leaders on Saturday in the national capital, to review preparedness for the general election.